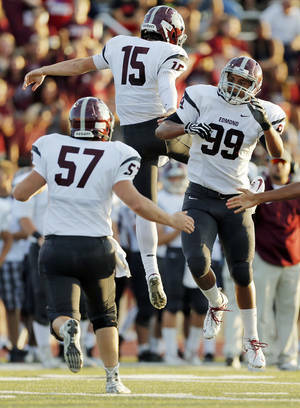 MOORE — Edmond Memorial coach Justin Merideth wasn't sure what to expect from his defense in the Bulldogs' season opener. While replacing some key contributors, the unit struggled at times throughout the preseason. The defense came together on Thursday night, overwhelming Southmoore in route to a 20-0 victory at Moore Stadium. "In our two scrimmages, we made a lot of mental mistakes on defense," Merideth said. "It was a lot of our new guys struggling. We were really tough on them in film the last couple weeks, and we told them if they just do what they're supposed to do we'll be fine. They cleaned up those mistakes and did what we've been asking of them tonight." The defense set the tone in the first half, limiting the SaberCats to 54 total yards and forcing a first-quarter fumble recovered by Chase Kemp deep inside Southmoore territory. Senior quarterback Mick Mayerske scored on a three-yard run two plays later as Edmond Memorial (1-0) grabbed an early 7-0 lead. Southmoore followed with a three-and-out, and a bad snap on the punt gave the Bulldogs great field position again. Mayerske then led his most efficient drive of the night, connecting on 4 of 5 passes and scoring on a two-yard sneak to make the advantage 13-0. "We've got to give all the credit to our defense," said Mayerske, who was 9 of 16 passing. "They kept this game out of reach all night. I feel like I played decent, but not up to my ability. Our whole team has had a tremendous offseason and I think that showed on the field tonight." Receiver Jordan Reed scored the Bulldogs' third rushing touchdown on the first play of the fourth quarter with a nine-yard reverse. Early in the game, Edmond Memorial star running back Warren Wand didn't look like the same player who rushed for 1,769 yards and 15 touchdowns last season. The senior eventually got going with 43 yards over the final two quarters to finish with 62 yards on 17 carries. Wand is working his way back into shape after missing time with a quad injury suffered last spring. "He's only probably carried the ball eight times since the last game of last season," Merideth said. "He's a little rusty and he's got to get back into playing shape. He was cramping up a lot, but he'll get there." Southmoore (0-1) alternated sophomore Conner Uselton and freshman Casey Thompson at quarterback much of the night before Thompson played the entire fourth quarter. Both played under pressure on nearly all of the SaberCats' 16 pass attempts, but Thompson eventually found time and connected on consecutive passes of 36 and 22 yards in the fourth. Thompson finished 4 of 12 for 63 yards. The SaberCats were without standout tight end David Gaines, who suffered a dislocated hip during practice on Monday. The senior was on the sideline in a wheelchair, and says he expects to be out at least the next four weeks.